A driver was injured after the cab of his semi-truck fell from an overpass on the Kennedy Expressway. 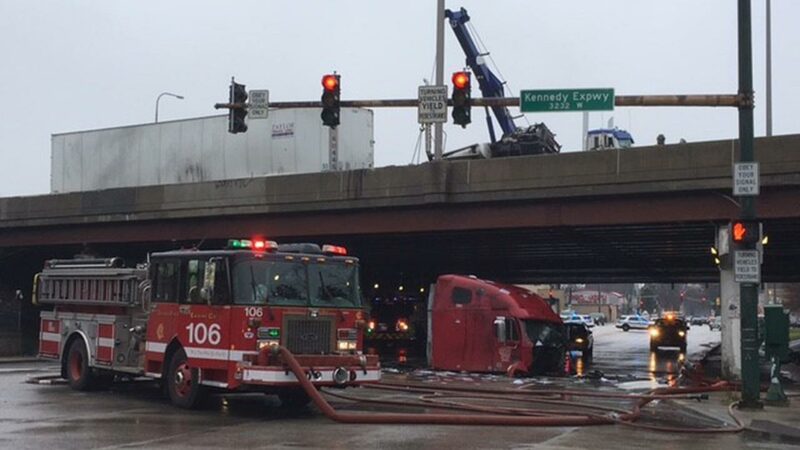 CHICAGO (WLS) -- A driver was injured after the cab of his semi-truck fell from the overpass Sunday morning in the Avondale neighborhood. The crash occurred at 8:08 a.m. in the outbound lanes of I-90 at the Kimball Avenue overpass, the Chicago Fire Department said. The semi-truck hit a wall, causing the cab to fall down to the street below while the trailer remained on the expressway. The driver was transported to Illinois Masonic Hospital in serious condition, the fire department said. No other vehicles were involved in the accident. The Chicago Fire Department called in a Level 1 Hazmat because the truck was leaking fuel. Two outbound lanes of the Kennedy were shut down as authorities investigated.